How do I Reduce Overheating Problems in My Windows PC? When a PC overheats, it can cause many problems with the inner workings of the computer, as the central processing unit (CPU) getting too hot can cause significant problems in its operation. There are many ways to fix this relatively common issue and prevent overheating, so that it doesn’t cause aggravating freezing and other unexpected disruptions that can result in the loss of work or important files. Diagnosing a computer problem can be a difficult task. Different symptoms are caused by different issues, and PC overheating problems also contain characteristics unique to them. The symptoms of an overheating computer are usually fairly broad, but there are ways to determine if it’s the problem. One issue you’re likely to experience is system crashes. If the computer unexpectedly crashes frequently without you attempting to shut it down, it could mean that the computer is overheating. Many problems can cause PC crashes, but if the computer crashes soon after starting it up, it could be attributed to PC overheating problems. Software freezing and slowdown when trying to complete actions can usually precede a system crash. Because all PCs have built-in temperature detection, if the computer gets too hot according to its range, it will react accordingly. When the computer freezes and completely locks up to the point where nothing is doable and the option to properly shut down isn’t available, this could be the result of PC overheating problems as well. Manually rebooting the computer usually resolves this problem temporarily. Try to avoid running too many programs that take up too much processing power at one time. Apart from crashing, rebooting at random can occur, where the computer will automatically restart without warning during regular operation. If this happens frequently, as with crashing or locking up, PC overheating problems could again be the culprit. Other symptoms of overheating include: the computer refusing to start up, blue screens of death (when the screen turns completely blue, halting every operation and displaying an error message), loud noises from within the computer, and if the processor feels hot to the touch from the outside. Prevention of overheating can be done in several simple ways, and therefore fix the problem effectively. Once viruses are no longer determined as a possible problem after a scan with proper antivirus and antimalware software, you can suspect overheating as the cause. Frequently blowing out the inside of the computer with an air canister will remove dust build-up that contributes to overheating as well as other problems. Keeping the computer, especially laptops, on a hard, smooth surface can also prevent overheating. 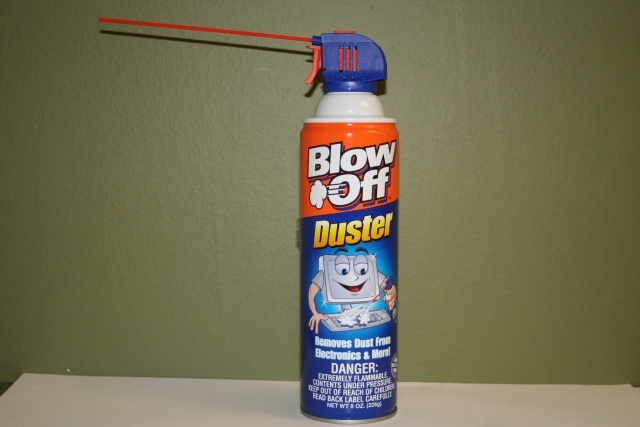 A can of computer duster used to delicately clean components. 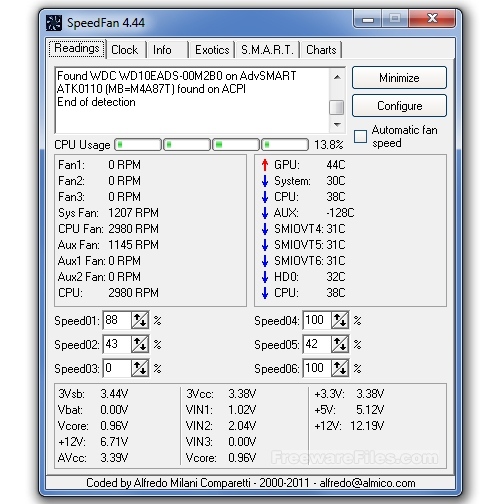 Software like SpeedFan can be downloaded to help gauge the temperature of your computer in different areas by monitoring the sensors. Cooling pads can also be purchased for laptops. Checking the temperature of your computer regularly by either touching or holding a thermometer up to the processor can help you discover a heating problem. SpeedFan’s interface, allowing you to view component temperatures and RPMs. Having a trustworthy computer repair shop diagnose your computer problems can also be done, allowing professionals to detect and fix the problem before it gets out of hand. While maybe not always as aggravating as a complex and hard-to-find internal software or hardware problem, PC overheating problems are not to be taken lightly. As with any operation-interrupting issue, you can lose vital information that isn’t backed up or be unable to complete day-to-day tasks. There are many ways to prevent this issue so it doesn’t become a life-disrupting annoyance.